Trust your team members. That’s one of the most important things as referee according to Bjorn Kuipers. Before the European Championships in France the Dutch press talked about Team Kuipers. In a previous tip in this series I already talked about communicating with your team members. Today is all about trust. During a match situation it’s not just about who spotted the foul itself, says Kuipers.”It’s also about the fact that someone in your team gives you an advice and that you follow your team member when you make a decisions”. That is trust. And that is what makes you grow as a team. Björn Kuipers has the luxury of working with the same assistant referees all the time. That’s not common for most referees. It reminds me of what what Eleni Antoniou said before she officiated Uefa’s Women’s u17 final earlier this year: “I trust in my team”. On the Uefa site she adds that she hopes that makes her become a better referee and more wonderful games in the future. 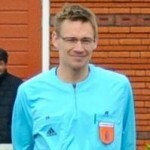 But Eleni Antoniou was officiating her games with assistant referees Oleksandra Ardasheva and Emilie Aubry, from Ukraine and Switzerland respectively, as well as fourth official Vera Opeykina of Russia. Referees she probably haven’t met before the tournament started. And that shows that it’s also very important for you at amateur levels that it’s possible to have trust in your team members even if you haven’t met before you got the appointment. But how to trust your team from the start? You can build it. Very important is that “trust” is your starting point. It reminds me of the presumption of innocence in court. You’re not guilty until proven otherwise. But then: you’re trustworthy until proven otherwise. If you can think in such a positive way, it’s a good start. The biggist similarity is: you’re all active in refereeing. And you’re all appointed in the same leagues. That’s what you already know when you haven’t been in touch. After setting up a WhatsApp group or call with referee and assistants you will see more things: you’re looking forward to the game, you want to make the best of it, you’ll get the same approach before the game. And so on. And then it’s the 80th minute of the game. A player runs on the right side of the pitch only a few metres away from your assisstant referee. The defender, who already got a yellow card, makes a sliding tackle. But did he make a foul and does he deserve a card? You’re not sure. Your assistant referee puts his flags in the air and calls for a foul. After a short consultation you show the defender his second yellow card. As referee you knew your AR was taking things seriously – as you do as well. He proved that during the game with his runs, calls and behaviour. That’s when you’ve gained more trust in each other. And that’s why you send the player off after two yellows. If you disagree there, players and coaches will notice and the last ten minutes of the game won’t be easy. That’s why trust is so important. “And the beauty of giving trust is that you get it back almost instantly.” So always start off with the positive thought and enjoy your games and build some good relations on your refereeing journey. Hi James, and if you have some personal experiences about it, feel free to share them here in the comments. Good luck with your refereeing career and building trust with fellow refs in your country.